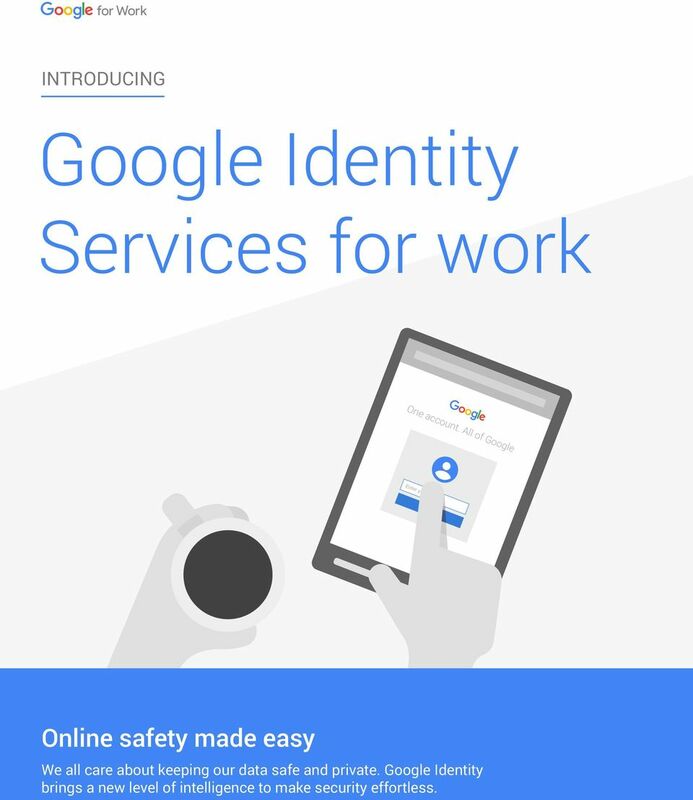 Download "Google Identity Services for work"
1 INTRODUCING Google Identity Services for work One account. All of Google Enter your Next Online safety made easy We all care about keeping our data safe and private. Google Identity brings a new level of intelligence to make security effortless. 5 Multi-factor Authentication Google builds security into our structure, technology, operations and approach to customer data. 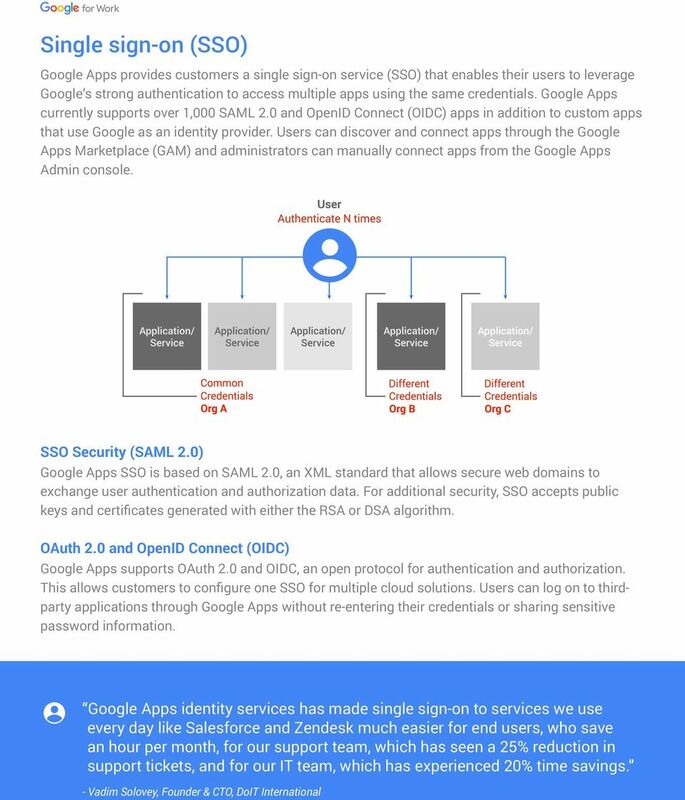 Our robust security infrastructure and systems become the default for each and every Google Apps customer. And beyond these measures, users are actively empowered to enhance and customize their individual security settings to meet their business needs through dashboards and account security wizards. Google Apps also offers administrators full control to configure infrastructure, applications and system integrations in a single dashboard via our Admin console regardless of the size of the organization. This approach simplifies administration and configuration. 2-step verification 2-step verification adds an extra layer of security to Google Apps accounts by requiring users to enter a verification code in addition to their username and password when they sign in. This can greatly reduce the risk of unauthorized access if a user s password is compromised. Verification codes are delivered on a one-time basis to a user s Android, BlackBerry, iphone, or other mobile phone. Administrators can choose to turn on 2-step verification for their domain at any time. Security Key Security Key is an enhancement for 2-step verification. Google, working with the FIDO Alliance standards organization, developed the Security Key an actual physical key used to access your Google Account. It sends an encrypted signature rather than a code and helps ensure that your login cannot be phished. Google for Work administrators can easily deploy, monitor and manage the Security Key at scale with new controls in the Admin console with no additional software to install. IT administrators can see where and when employees last used their keys with usage tracking and reports. If Security Keys are lost, administrators can easily revoke access to those keys and provide backup codes so employees can still sign-in and get work done. 7 Endpoint Management Mobile device management (MDM) Mobile device management in Google Apps eliminates the need for on-premises device or thirdparty management solutions. Administrators can enforce policies over mobile devices in their organization, encrypt data on devices and perform actions like remotely wiping or locking lost or stolen devices. This type of control helps ensure the security of business data, even if employees choose to work on their personal phones and tablets. MDM in Google Apps works with Android, ios, Windows Phone and smartphones and tablets using Microsoft Exchange ActiveSync, such as BlackBerry 10 Policy-based Chrome browser security All of the tools and features in Google Apps are best supported by Google Chrome. Administrators can apply security and usage policies across Windows, OSX, Linux, ios and Android. Chrome s standard security features include Safe Browsing, sandboxing and managed updates that protect users from malicious sites, viruses, malware and phishing attacks. There are also measures in place to prevent cross-site scripting, which attackers can use to steal private data. Google Apps administrators can deploy Chrome for Work across their organization and customize it to meet their needs. 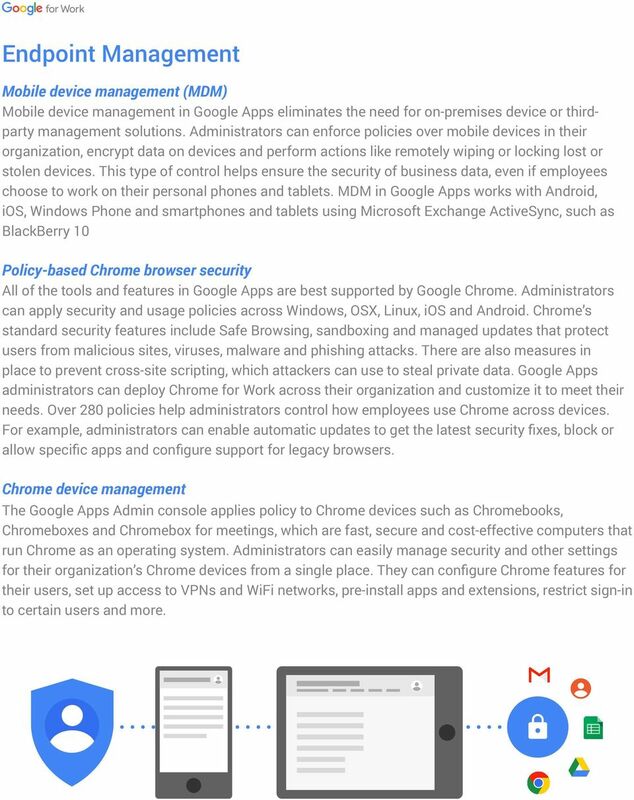 Over 280 policies help administrators control how employees use Chrome across devices. For example, administrators can enable automatic updates to get the latest security fixes, block or allow specific apps and configure support for legacy browsers. Chrome device management The Google Apps Admin console applies policy to Chrome devices such as Chromebooks, Chromeboxes and Chromebox for meetings, which are fast, secure and cost-effective computers that run Chrome as an operating system. Administrators can easily manage security and other settings for their organization s Chrome devices from a single place. They can configure Chrome features for their users, set up access to VPNs and WiFi networks, pre-install apps and extensions, restrict sign-in to certain users and more. 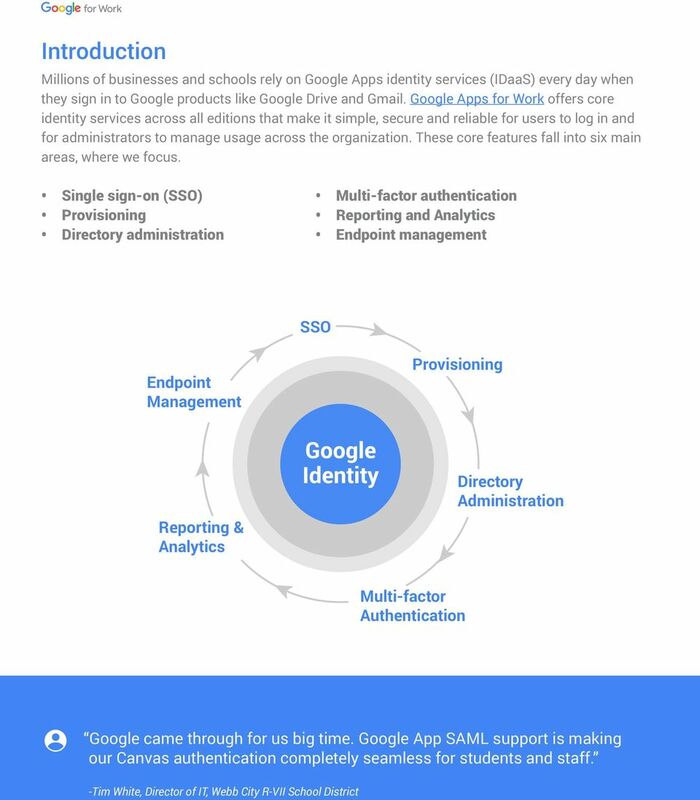 8 FAQ s What does Google s identity service cost to use? 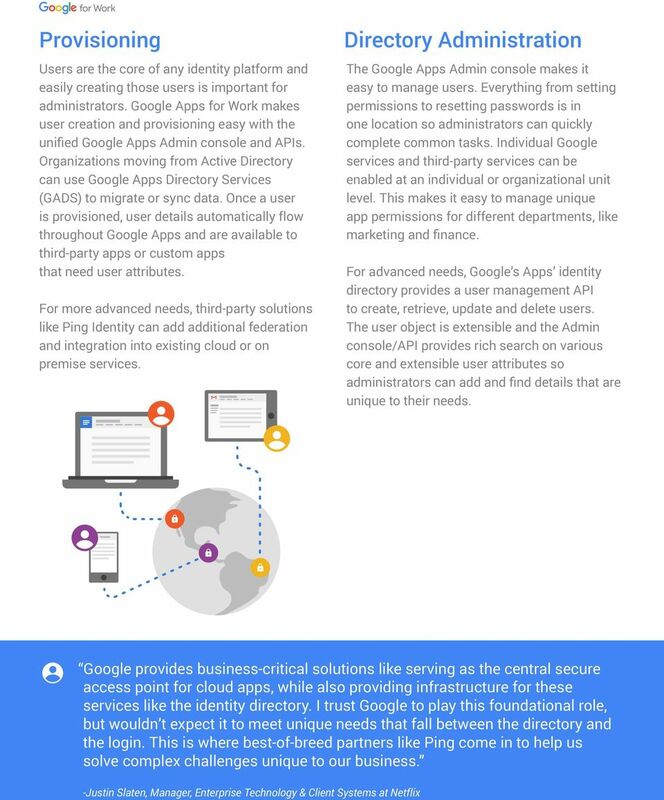 Google s identity services are included in Google Apps for Work at no additional charge. Google Apps for Work starts at $5/user/month for the basic plan and offers a premium plan at $10/user/ month that includes unlimited storage, advanced audit and reporting capabilities and Google Apps Vault for ediscovery and retention. 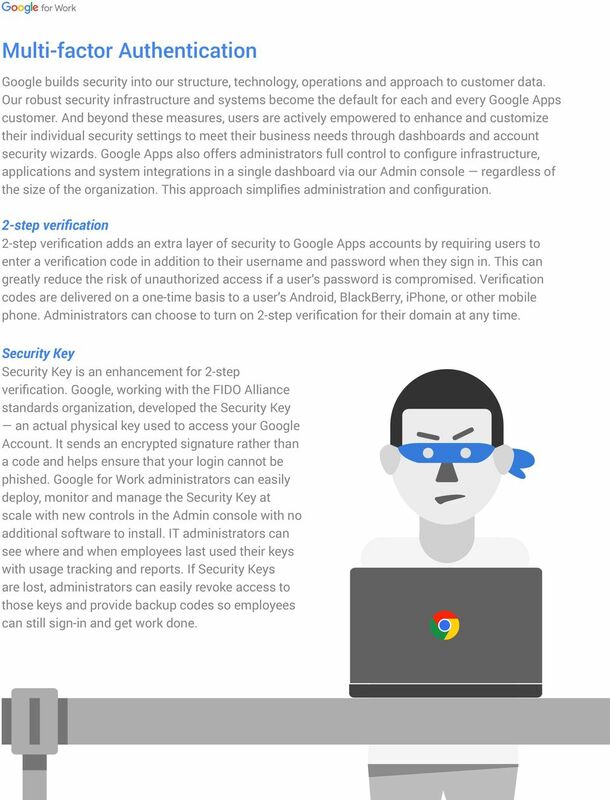 How can I learn more about Google Apps security and compliance? 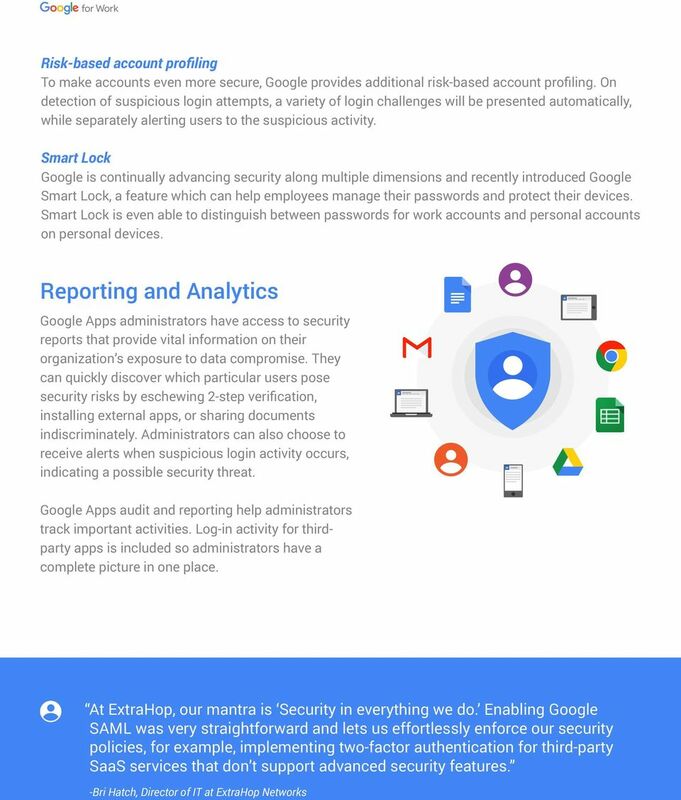 The Google for Work Security and Compliance Whitepaper describes how Google protects your data, meets regulatory and compliance needs, and empowers users and administrators. Who owns the data I put into Google Apps? To put it simply, the data that companies, schools and governments agencies put into our systems is theirs, whether it s corporate intellectual property, personal information or a homework assignment, Google does not own that data. That means three key things: 1. We do not use your information for any other purpose than deliver you the service you pay for. There are no Ads in Google for Work. 2. You have control over your data. We provide you with tools to delete and export your data so that you can take your data with you at any time, use external services in conjunction with Google Apps or stop using our services altogether. 3. We protect your information from third-party requests and government access. 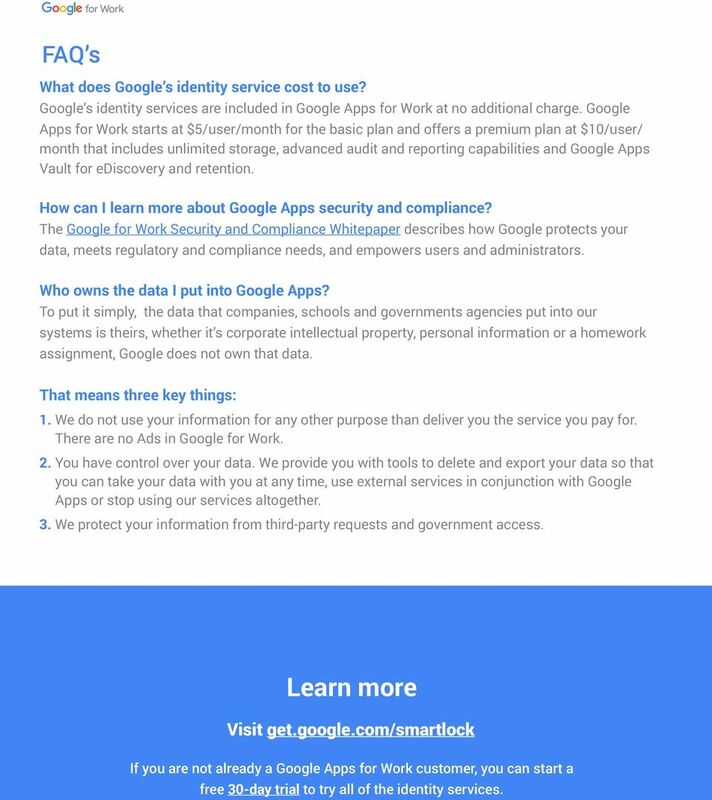 Learn more Visit get.google.com/smartlock If you are not already a Google Apps for Work customer, you can start a free 30-day trial to try all of the identity services. SOLUTION BRIEF MOBILE SECURITY Securely Accelerate Your Mobile Business CA Technologies allows you to accelerate mobile innovation for customers and employees without risking your enterprise data or applications.